Surfwise and Bigger Stronger Faster !, 2 movies you have to see ! Its not often you can have two movies out that get 100pct on Rotten Tomatoes. If you dont know what that means, it means that 100 pct of the reviews on both our movies, Surfwise and Bigger Stronger Faster are postive. Its an amazing feat for one movie, but to have two out is incredible. Surfwise is about a surfer, Doc” Paskowitz. Once an admired figure in the medical community, Doc decided while at the height of his success to do what many have dreamed of, to leave it all behind, and head to the beach. While traveling the world in search of the next great wave, Doc got married , and had nine kids. Rather than retreating to a “normal” life to raise his kids, Doc did the opposite. He never placed his kids in school, raised his kids, and lived, all 10 of them, in an ever moving camper. The only required routine was that they surf every day and eat organic. Doc wanted to raise his family the way animals live, free of the material world. The film takes viewers on a turbulent ride through the family’s complex history, first focusing on its patriarch and then slowly moving through the years with commentary by the family’s seven now-grown children. Careful never to judge, SURFWISE simply presents the story as experienced by those on the inside. Scenes of complaint by the adult children are countered by a hopeful reunion at the end. Its an incredible look at a real family who tuned out, and the reality that followed. Critics have called the movie mesmerizing, thought provoking, fascinating, absorbing, remarkable, powerful and more. For more information and where you can see it, check out the Surfwise website and see the movie. I promise you will love it. The reviews really say it all. I love this movie because its a hysterical look at the sports world. Steroids are the common theme in the movie, but its a theme that is ripe for humor. 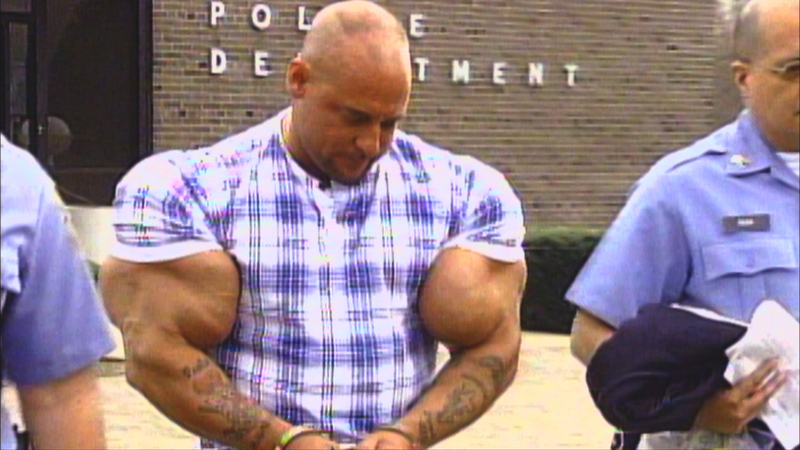 How can a guy with guns like Gregg Valentino not be (pic below). This movie takes on everyone and takes no prisoners, pointing out the hypocrisy of how we view winning in sports.